Below you will find a sampling of unique events we have hosted or host annually. Google, Google X, Linkedin, Youtube, Airbnb, The Battery, Capital One, The North Face, Red Bull, Reddit, Pinterest, Disqus, Clever, Lever, Imgur, Plangrid, Digital Detox/Camp Grounded, Everlane, Juniper Ridge, The Outpost, Outbound Collective, Hipcamp, 8 Shields/Art of Mentoring, Nueva School, Hamlin School and a variety of prestigious wedding and Event Planners. 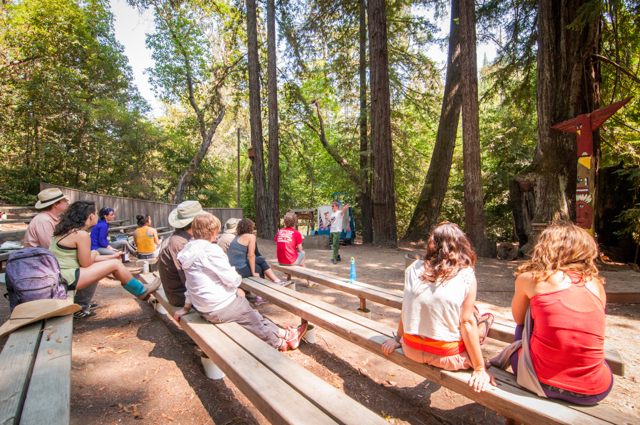 We also host annual music festivals including The Redwood Ramble and Camp Deep End and in the past we were the home of Enchanted Forest, Bliss Camp, and Spirit Weavers Gathering. 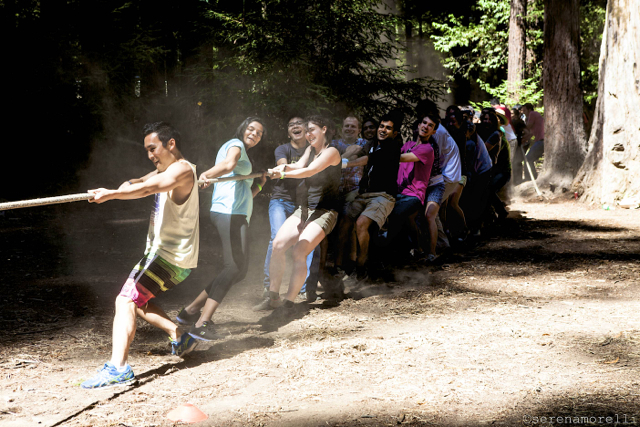 Camp Imgur 2015 is officially launched, set to arrive at Camp Navarro this August! We will be joined by the incredible staff of imgur and 500 of their most prolific contributors. We are excited to be producing this "internet goes outernet" event. We will be hosting shenanigans like pie eating contests, monster slip n slides and a fully appointed carnival dunk tanks. We are excited to birth new memes in the redwoods with the internets most crazy-fun subculture. We are now in our third consecutive year of hosting The Redwood Ramble. We are incredibly honored to partner with Steve and all of the other amazing talent at Ramble on Productions. What a blast we had with 70 crazy-awesome Googleites in January 2015. We ran them on hikes, taught them Wilderness Firestarting, shot arrows, slingshots, and wrote notes to mom in our Camp Post office. Kevin and Brianna held a lovely wedding of 120 guests. Her reception and ceremony site was hosted in the redwoods at our camp picnic tables. During this event Camp Navarro provided all activity and event programming, food, fun and lodging. It's a turn key program for the customer and their staff. All they do is show up with sleeping bags and personal items, prepared to have an adventure. It was all hands on deck as we led them through an active itinerary of fun and adventurous "Camp" activities. Bob led the wilderness fire starting classes, helping people understand their is no hacking a way to starting a fire. You just need to learn how. Christopher was the Archery Range commander and Mr. "Bull Horn" Brodeur keeping the crew well informed during Camp. Don led the hikers on nature walks, including a night time star gazing hike with over 100 people in tow. Deborah was traffic control, making sure things flowed in generally the right direction and on schedule. In the end, they left excited, sunburned, well-fed, exhausted and connected with each other to a degree many had not experienced before, thanks in large part to strategic WiFi shutdowns. Above the Trees is a four-day festival in the woods encompassing art, music, talent and knowledge. The fun twist is that all of this content is provided by you, the community, with every individual contributing on some level to create an amazing participatory experience. Whether through classes or decoration or food or games or costumes or volunteering for the event itself, everyone plays a part in sharing something of themselves and being inspired by the awesomeness of those around you. Above the Trees is a summer camp for adults where everyone's a camper and a counselor. Mighty Earthling is about magic. Not hocus pocus or Disney-like magic, but the real, regular and natural kind – the kind that makes baby seahorses, falling stars, and spider webs. Kids are feeling machines, literally. Everything in their bodies is attuned to developing their five senses first, giving them superhuman powers of perception. Their feelings, good or bad, become embedded in their cells. As we get older we feel less, think more. If she can look forward every year to that precious and exhilarating feeling of aliveness experienced in this wide expanse of Nature and earth and sky she will love these things as she loves herself. Because they are her. They are us. Magic is real. Sarah and her husband, Ben, held their wedding over a three day weekend with 125 + guests arriving from around the world. They had three days of activities, party and music throughout the camp, with a ceremony in our spectacular Redwood Cathedral. Everyone married at the Camp so far has been mesmerized by their event, as have their guests. 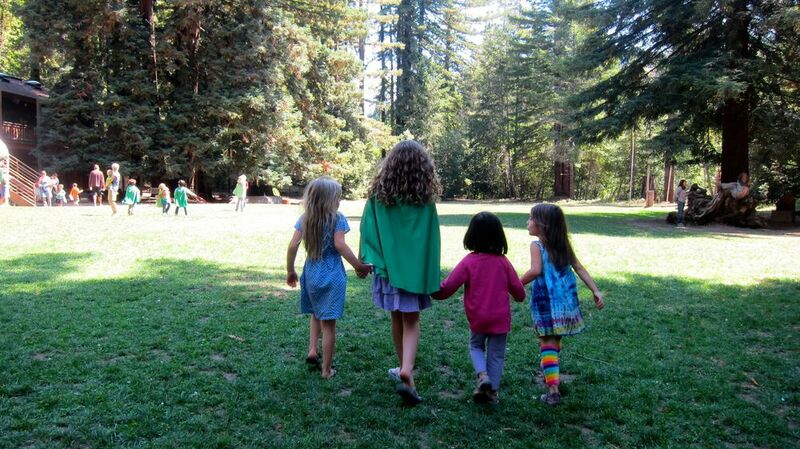 The Redwood Ramble is a family-friendly, music-infused campout in the redwoods of (Mendocino County) which will take place from Thursday, July 3rd through Sunday, July 6th, 2014. This event is follow-up to Joy Kills Sorrow, an alt-Strawberry Survival Party that was thrown together at the last minute over Labor Day Weekend 2013 following the cancellation due to the devastating Rim Fire near Yosemite. They all had such a great time at Joy Kills Sorrow that they have decided to throw a new and improved version of the event in 2014. The Redwood Ramble will feature more than 15 bands on the main stage in addition to performances on the Amphitheatre stage. 2014 event included food available for purchase and an expanded Kids’ Program, among other improvements. I encourage you to check out the About the Redwood Ramble, What to Expect and Testimonials pages. You also might want to check out our News Feed for updated information and announcements. If you like what you see, grab some tickets now before they're all gone and we will look forward to seeing you there! Camp Grounded had another successful year at camp. We were overjoyed to see the changed lives that happened here at camp, and help individuals to reconnect with nature, themselves and each other. Camp Navarro runs world class team building weekends. C3 Journey is a christian 2 to 3 day event with teaching, break out sessions, team building and fire pit time. It is a "full on" Journey in a Boot Camp style setting. Great for extreme team building and leadership training. Over 200+ lucky campers will take over this nostalgic scouts camp to celebrate what it means to be alive. schedules and work-jargon for an off-the-grid weekend of pure unadulterated fun. Together we'll create a community where money is worth little... and individuality, self expression, friendship, freedom and memories are valued most.